Measurement tools linked by a wireless interface are engineered to make jobs faster, safer and more efficient. Suit up in personal protective equipment (PPE). Attach individual current-measuring device (in this case, the Fluke a3001 FC Wireless iFlex® ac Current Modules) to all three legs, or lines of incoming current, of the motor. Close the panels; remove PPE. 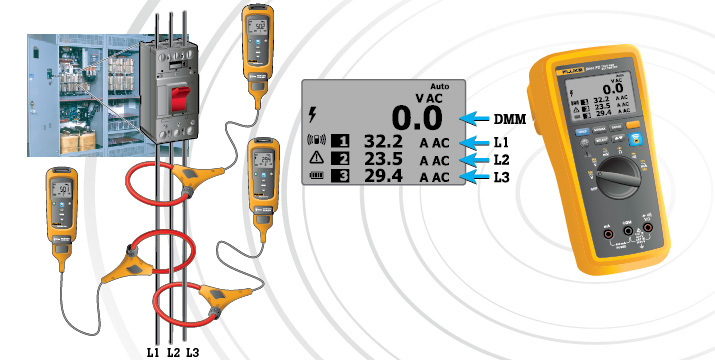 Remotely monitor the readings collected by the modules via a wireless digital multimeter, a phone equipped with the Fluke Connect® app, or a laptop with wireless adapter and the Fluke Connect® app. No need to reopen and reclose the panels to check readings. Reduced risk of arc flashes, since panels do not need to repeatedly opened and closed. Taking measurements when the panel door is closed provides a big safety boost. No need to repeatedly put on and take off PPE. Access to on-demand measurement readouts for the duration of the test, whether it is scheduled for a few minutes, a few hours or a few days. Monitoring multiple measurements at once helps you isolate the current imbalance faster. Logging saves you time—you can identify load balancing issues without being physically present.